Online slot developer NetEnt have a habit of releasing slot titles that just seem to attract a lot of attention, build a lot of hype and yet still manage to deliver the goods despite all the expectation. 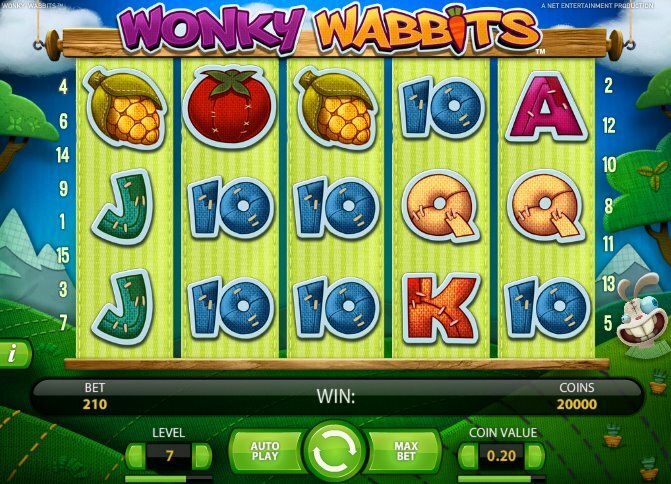 Previously, we have seen the innovative Big Bang slot and the comedy-themed South Park slot acting as perfect examples of that and now we have this little gem in the form of Wonky Wabbits. Those Wonky Wabbits Got Crazy Eyes! 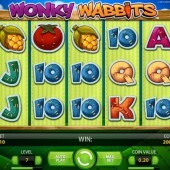 Wonky Wabbits is a 5-reel slot that is based around rather bizarre looking rabbits. One might suggest that these rabbits breach a morality code or two with their “crazy eyes” and stitching but let’s not worry about what the political correctness brigade will be saying. This is a slot that has all the color and vibrancy of a sure fire hit that we’ve come to expect from a NetEnt slot recently. Yes, you’ve guessed it, all the symbols on this 15-payline game are rabbit-related (or should that be wabbit-welated?). There’s an array of vegetables that our furry friends love to nibble on such as carrots, aubergines, tomatoes and corn cobs. It should be noted, these cartoon characters are not actual rabbits but seemingly stuffed toy rabbits that have their own personalities. Something nightmares are made of! Watch the Wabbit Go Wild! The Wild symbol is represented by a Wild icon that becomes animated with a Wonky Wabbit bursting its head through it whenever you complete a winning combination with the Wild. That’s a nice little touch, albeit slightly strange. What can I say? These wabbits look unhinged. The main feature on this slot is the Wild Duplication feature. This is where if you it a Wild across the reels then the symbol next to it will turn into a Wild as well. This can lead to some really big wins if you hit multiple Wilds across the reels. You get a sense of what this slot is all about with the intro screen that says you can win up to 390,000 coins on this slot and it is also possible to win both ways. That’s always something you want to hear when you’re about to start playing on a slot. NetEnt is always a developer that releases a new slot to a positive reception. Wonky Wabbits is certain to be another one of those slots. It really could have done with a free spins bonus round and maybe an interactive bonus feature but the Wild Duplication feature can pay out some big prizes and this is definitely one for those players that can do without the extra features provided there’s still the chance to hit some big wins.